Vito Acconci is an American performance/installation artist who began performing in the late 1960s. More recently, he has shifted his focus to architecture and landscape design, particularly works that merge indoor and outdoor space. Joseph Beuys was a German multi- and mixed-media artist best known for incorporating ideas of humanism, social philosophy and politics into his art. Beuys practiced everything from installation and performance art to traditional painting and "social sculpture." He was continually motivated by the belief of universal human creativity. American performance artist Chris Burden is most known for his 1970s works that placed him in extreme danger, such as being shot in the arm by an assistant or being crucified on the back of a car. 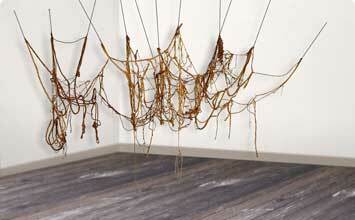 Eva Hesse was a major New York artist whose sculpture, assemblage, and installation brought issues of feminism and the body into Minimalism's formal vocabulary. She is heralded as one of the quintessential Post-Minimalist artists. Sol LeWitt was an American artist commonly associated with the Minimalist and Conceptual movements. He rose to prominence in the 1960s with the likes of Rauschenberg, Johns and Stella, and his work was included in the famous 1966 exhibit Primary Structures at the Jewish Museum. LeWitt's art often employed simple geometric forms and archetypal symbols, and he worked in a variety of media but was most interested in the idea behind the artwork. Robert Morris is an American artist whose early L-beam and column sculptures were key works in Minimalism. His work also includes felt and fabric pieces, performance, body art, and earthworks, often with an emphasis on process and theatricality. Bruce Nauman is a contemporary American artist concerned with language, process, manipulation, and the registers of irony. His work includes performance, video, installation, neon sculpture, and other materials. Richard Serra is an American Process and Minimalist artist. His sculptures have ranged from hurled drips of molten lead to gigantic steel pieces installed in public places.